On his return to the States he decided to try his hand at boat building and constructed a 42 foot fiberglass catamaran which he had initially planned to sail back to the South Seas, but he finished up selling it. It was not to be his boat building that would bring Bruce Meyers into the public eye however, it was his car building. In addition to surfing and sailing a young Bruce Meyers was, like most American young men, interested in having fun with cars. 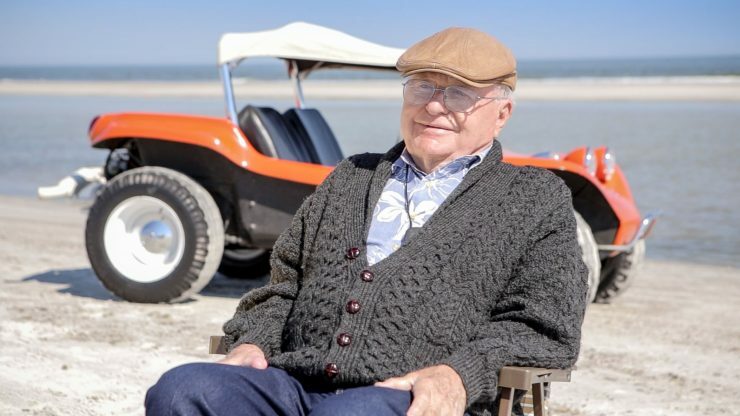 He’d put together a hot rod and had some fun with it, but when he discovered beach buggies he realized he’d hit upon an activity that was a natural blending of his love for the sun and surf, and for fun automobiles. 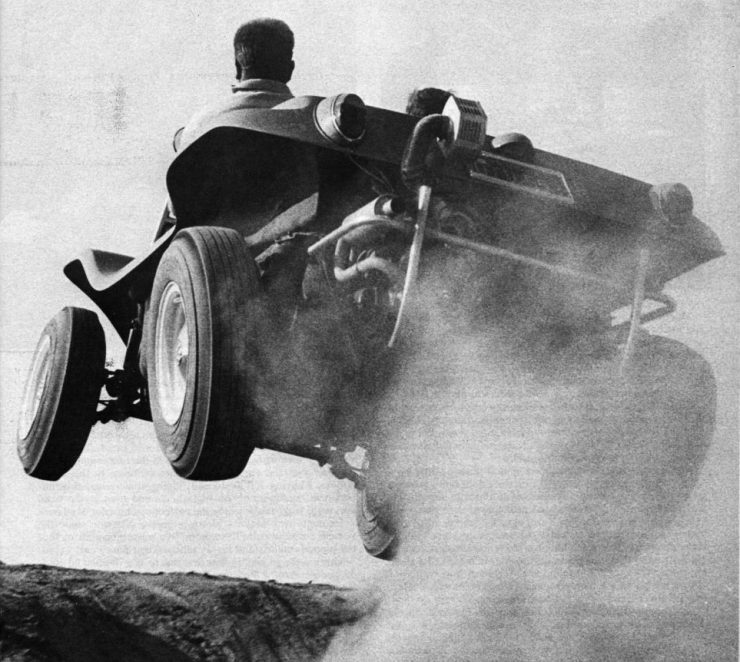 The issue for Bruce was that the existing beach buggies seemed rather lacking, both in aesthetics and performance. Could he do better? 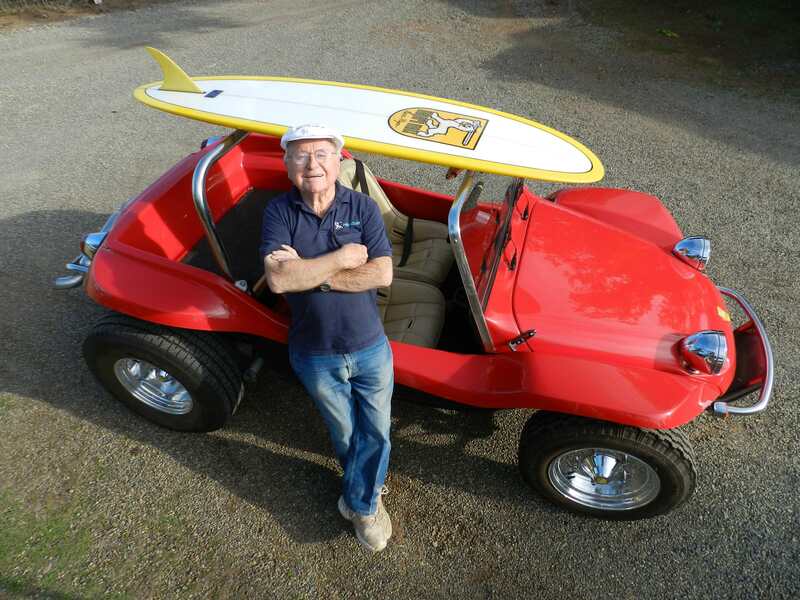 With his hot-rod building experience combined with his fiberglass boat building experience Bruce figured he pretty certainly could, and so he set about building what he considered to be a beach buggy that was a huge improvement on what everybody else was doing. His first beach buggy was “Old Red”, and although it was based on Volkswagen parts Bruce wanted to build something that would be a significant change on Dr. Ferdinand Porsche’s original design, specifically designed to be lightweight and highly capable off-road. 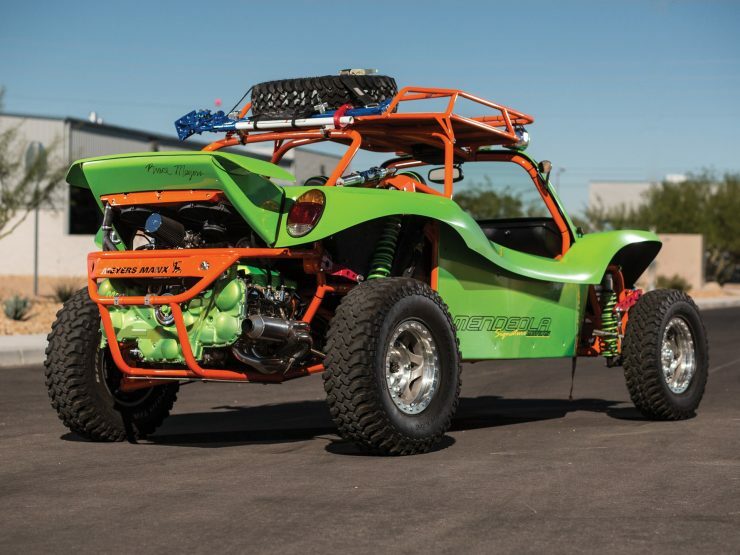 To build his new Volkswagen-based buggy Bruce Meyers used rear trailing arm suspension parts cannibalized from an old Chevrolet pickup, and he designed and built his own unique steel reinforced fiberglass unibody for it. That unibody was to set the style for his Manx that would be the successor of “Old Red”. 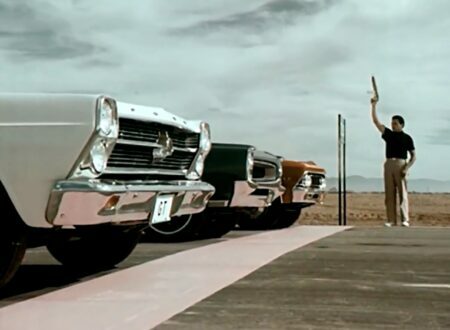 He made the unibody much like the hull of a boat, with complex curves helping provide both structural stiffness and a unique, endearing appearance. Bruce Meyers believed he had something of a winner in “Old Red” and so he decided to have a go at the run from Ensenada to La Paz, to see if he could match, or perhaps even break the record, which was at that stage held by Dave Ekins and Billy Robertson Jr. on a Honda motorcycle. Their run had begun in Tijuana and ended in La Paz, a journey of 952.7 miles/1,533.2 km. Ekins and Robertson had begun their attempt just after midnight on March 22nd, 1962 and finished in La Paz 39 hours and 56 minutes later, setting the record. 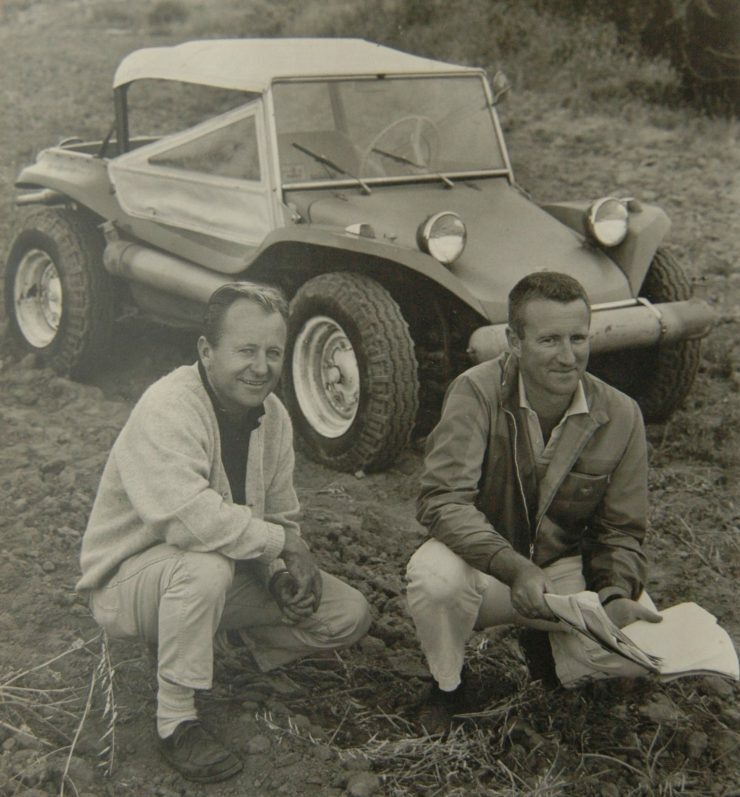 Ekins, Robertson, and their Honda, had gained significant publicity and Bruce Meyers could see that he could do that run in “Old Red”, possibly more quickly, and that the publicity could do his beach buggy building business quite a bit of good: and it looked like a fun thing to attempt. To the same extent he realized that failure would not be a good option and so Bruce and his team spent five years preparing for the run. 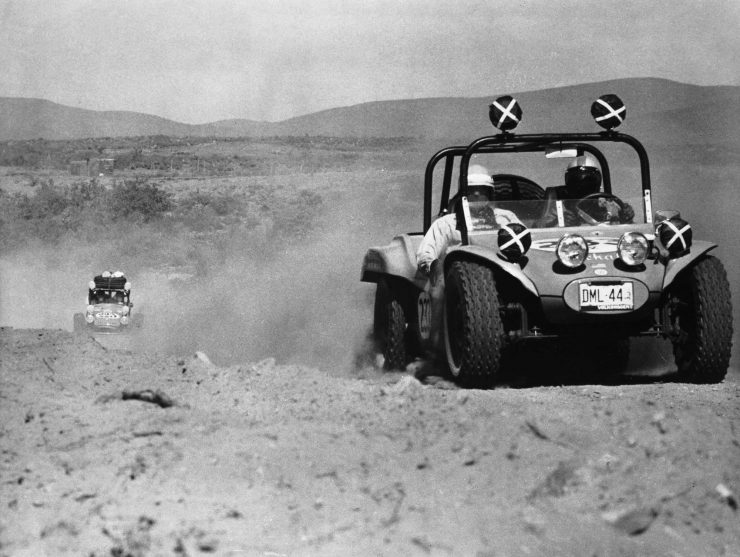 The vehicle used for the Tijuana to La Paz record attempt was “Old Red”, Bruce’s first beach buggy complete with Chevy pickup rear suspension. Bruce and Ted Mangels made their departure from Tijuana at 10:00pm on April 19th, 1967, and arrived in La Paz 34 hours and 45 minutes later, shaving more than five hours off the time set by the motorcycle team. Bruce, Ted, and “Old Red” became household names and the beach buggy building business was properly launched. 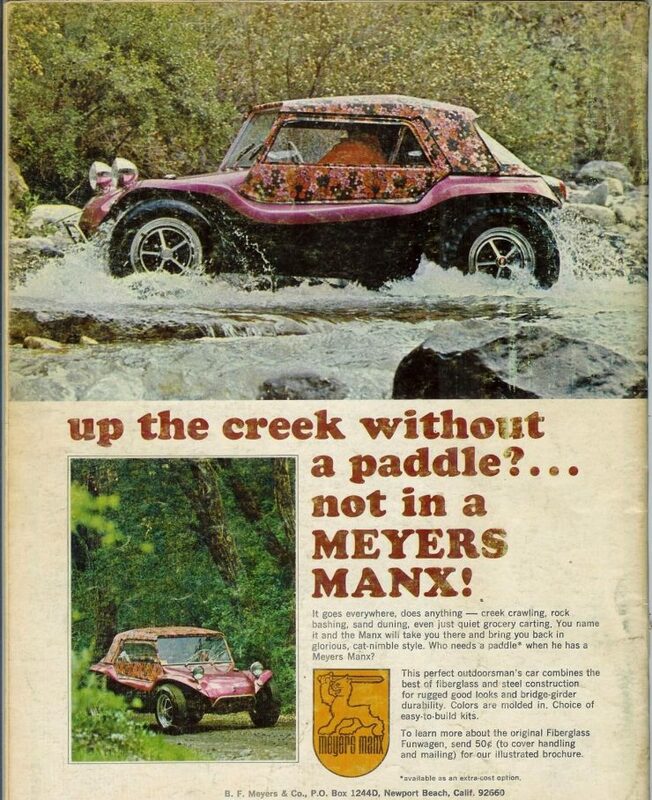 Not only was the Meyers beach buggy business launched, but the publicity generated by their run led to the creation of the Baja 1000 race which was organized by the newly formed National Off-Road Racing Association (NORRA) with the first race being held later that same year, on October 21st, 1967. The one major stumbling block Bruce faced was that the price of the fairly sophisticated kit needed to build “Old Red” clones was quite high. The less complete, and thus less expensive kits required a great deal of owner fabrication and thus required that the builder be highly skilled. The more complete kits were necessarily more expensive and did not sell well. Only about a dozen kits of “Old Red” were sold. What was needed was a kit that would be affordable, and that would be able to be built by people with a moderate skill set. Bruce reviewed his full unibody design and decided that Dr. Ferdinand Porsche had actually got the design of the Volkswagen right back in the 1930’s: something that should come as no surprise to any of us if we think about Dr. Porsche’s original design brief. Back in the 1930’s Dr. Porsche had been tasked with designing a “People’s Car”, a car that could do 100km/hr on the autobahn, and that could go pretty much anywhere be it in the heat of the North African desert, or the permafrost of Siberia, and all the shades in between. Contrary to popular belief the Volkswagen was not designed to be solely a shopping car for an elderly grandmother – despite the fact that it could do that rather well also: it was designed with military potential. 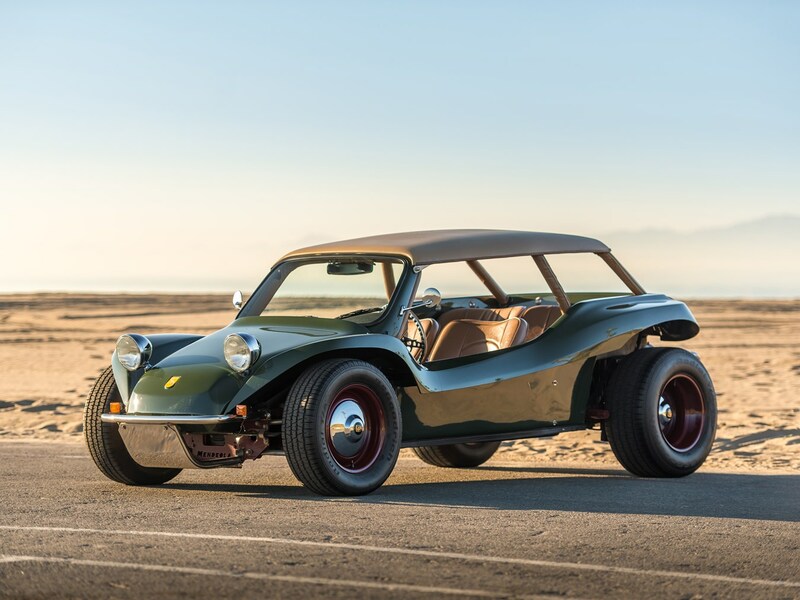 Bruce Meyers realized this and so created his next beach buggy, the Meyers Manx, based on a shortened version of Ferdinand Porsche’s Volkswagen floorpan. This eliminated the need for the complex and expensive to manufacture steel reinforced fiberglass unibody shell used in “Old Red”, and allowed the use of a much less complex fiberglass body shell. This made the kit quite a bit cheaper and made kit construction significantly easier. This was the Meyers Manx and the kits began selling fast, too fast for Meyers to be able to supply demand. 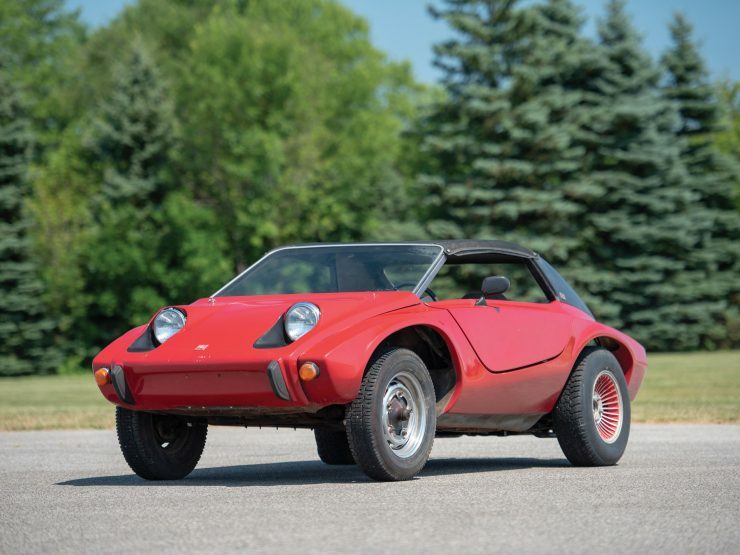 Ultimately 5,280 Meyers Manx kits would be sold. With the Meyers Manx selling well Bruce also created other models. The Manx 2 was an updated version of the original Manx and they are recognized by the larger bump on the hood and were made with a hood and dashboard fabricated in one piece fiberglass, as opposed to the original Manx which had a separate ABS plastic dash. Early production Manx 2 models have steel reinforcing tubes under the fenders, later ones do not. In the Manx 2 the spare tire well and battery sump in the rear of the passenger area are eliminated. A few hundred Manx 2’s were made. 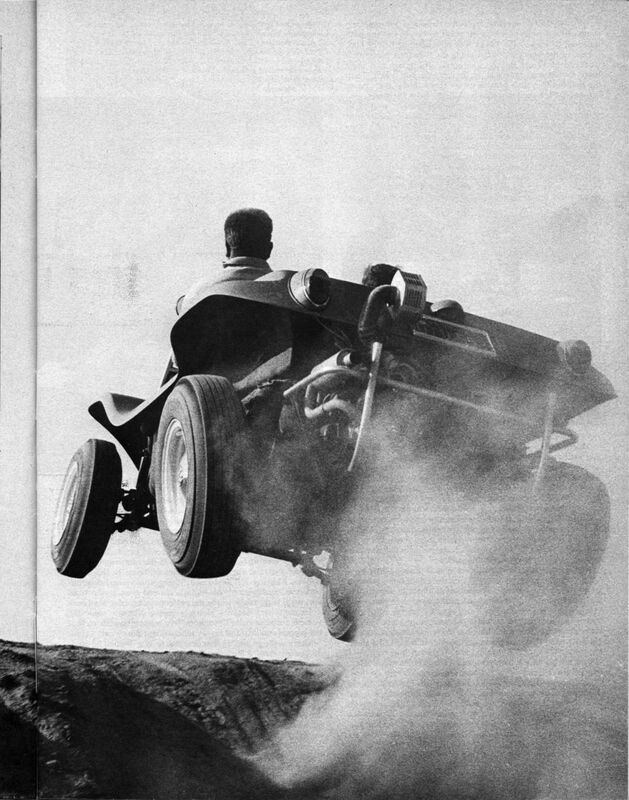 For the off-road only competition user Meyers offered a simplified version of the Manx which was called the “Tow’d” not because it hopped about like a frog but because it had to be towed on a trailer to the place you intended to drive it. About a thousand Tow’ds were sold. Customer demand led to the creation of a road legal Tow’d with fenders and roof, but that “customer demand” did not translate into significant sales. 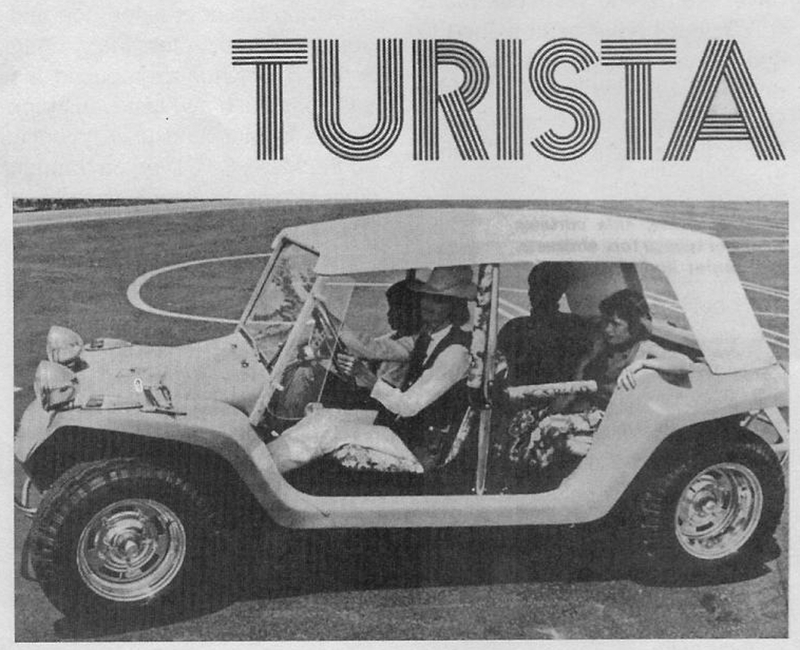 Bruce also created versions of the Manx for resorts called the Resorter (Also known as the “Turista”). The Resorter was specifically made for resorts in places like Hawaii and was a four-seater which featured lowered sides for easy passenger entry and exit. About seventy-five of these were made. The other model made prior to the company closing in 1971 was the Meyers Manx SR (SR standing for “Street Roadster”). This was a road going sports car made with doors and a Targa style roof. 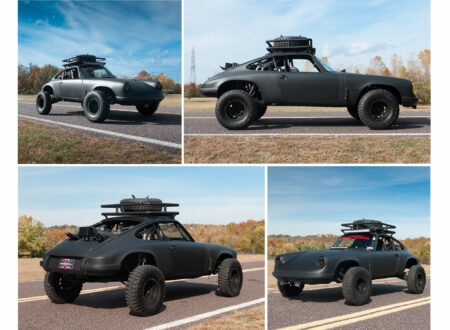 It was sort of a cross between a Manx and an affordable Porsche. It deserved to sell rather better than it did with a hundred or so being made. Last of all were three Utility versions of the Manx made for government departments, two for Los Angeles County for use as lifeguard vehicles and the other for the California Forestry Service. The Utility intended for the Forestry Service was stolen before it could be delivered and although it disappeared for years it eventually turned up. These Utility versions of the Manx featured a covered rear tray and necessitated the use of the “pancake” version of the Volkswagen engine. There was one other version of the Manx made in this period and that marked a return to Dr. Ferdinand Porsche’s original concept for the Volkswagen: this was the “Kuebelwagen”, a throwback to the World War II German Staff Car. 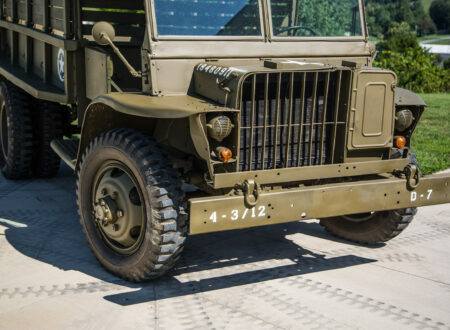 It was built on a full length Volkswagen chassis, just like its wartime predecessor, but fabricated in fiberglass. It is said that imitation is the greatest flattery, but when you are trying to make money, having others copy your idea is not such a nice situation to be in. Even as Bruce Meyers found himself beginning to sell kits in the thousands, other people went into business making cheaper, lower quality kits. Bruce had foreseen this possibility and had taken out patents where possible to protect his ideas. But when he went to court to try to enforce his patents against his competitors he faced a controversial judgement – it was decided that his unique concept was not-patentable. 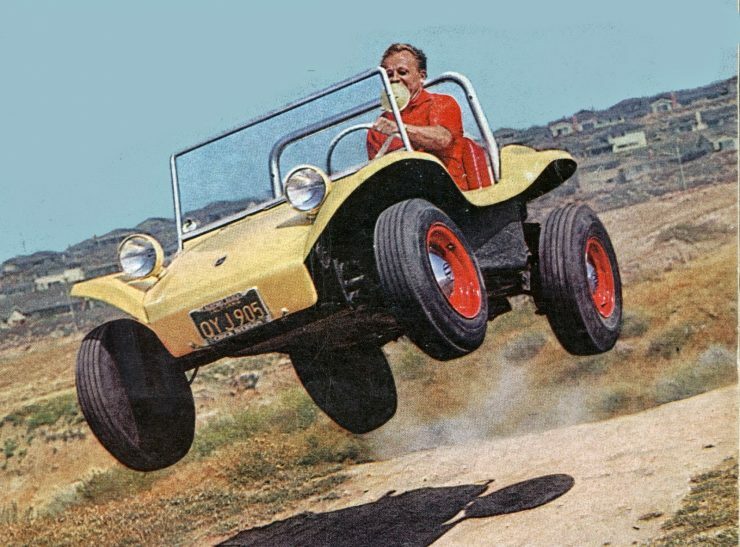 This judge’s decision has been decried by legal experts countless times in the decades that followed as the Meyers Manx design was clearly a unique and patentable creation. 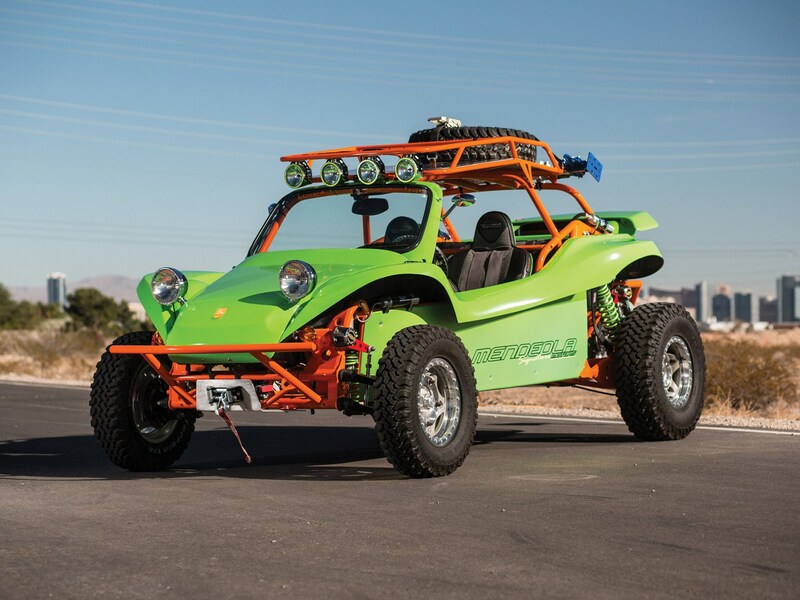 After the judge’s decision the flood gates opened, innumerable copycat beach buggy builders began popping up around the USA and around the world. The glut of cheap and poorly made kits flooded the market, leaving Meyers Manx no choice but to shutter operations and close down – but fortunately not forever. Bruce Meyer’s departure from B.F. Meyers & Co. in 1970 looked like it would be the end for the Manx, but it wasn’t: in 2000 Bruce Meyers founded Meyers Manx, Inc., based in California. In founding this new company Bruce has stayed true to the original roots of the Meyers Manx and offers kits that are based on Ferdinand Porsche’s Type 1 Volkswagen, with the addition of some kits being suitable for use with the later “Super Beetle”, and, as we would expect, none for the new front wheel drive Beetle. The modern front wheel drive Beetle was designed from the ground up as a road car, quite unlike Dr. Porsche’s Volkswagen of the 1930’s, and it therefore does not lend itself to turning into an off-road Manx. The first of the new Meyers Manx models was the Manxter 2+2 which was introduced in 2002. This was a true four seater version of the Manx based on a full length Volkswagen Type 1 Beetle chassis. This was followed by the DualSport kit in 2004. 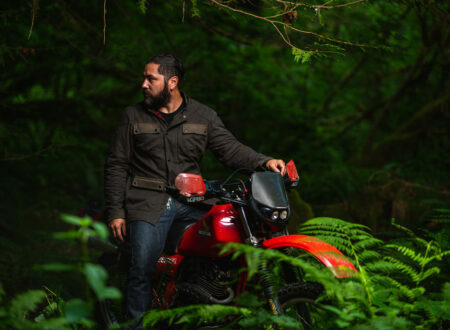 The DualSport kit was made with 3 inch higher sides to clear bigger off-road tires and had humps at the front to clear the shock-absorber towers while at the rear the flat section was made to clear the coil covers. The DualSport kit was made to be based on the Type 1 Volkswagen chassis, and there was also a version made to suit the Super Beetle with a mid-travel front beam. The DualSport kit finally led to the creation of the DualSport Baja Edition in 2015. It was an obvious thing to do but Bruce was sensible about not rushing into it. He’d broken both front legs in an accident on his second attempt at the Ensenada to La Paz Baja 1000 and has some stainless steel in his “bodywork” to prove it. The DualSport Baja Edition was built on a custom chassis and only supplied as a complete kit featuring a Down South Motorsports suspension, Fox shock absorbers, Jamar Pro X Brakes, and Method wheels among its parts inventory . It is perhaps the ultimate expression of Bruce Meyers’ original vision when he built “Old Red” back in the 1960’s. Satisfied with how things were going Bruce created the Kick-Out Traditional and the Kick-Out SS in 2009. The Kick-Out Traditional was built on the shortened Volkswagen chassis Meyers Manx, with some updates but generally faithful to the original. The Kick-Out S.S. is made as a more modern looking Manx with a curved windshield, and headlights flared into the hood cover. This model also features a sculpted rear deck cover with twin roll hoops. The name “Kick-Out” comes from the action a surfer performs as he/she comes to the end of their ride. 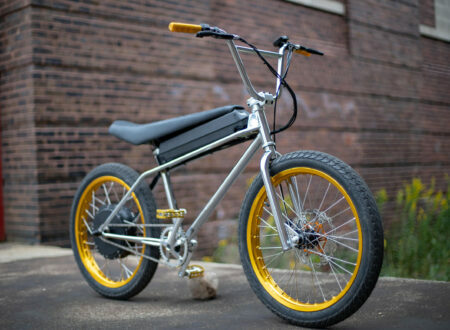 The Meyers Manx are in production and look like remaining so for the foreseeable future. 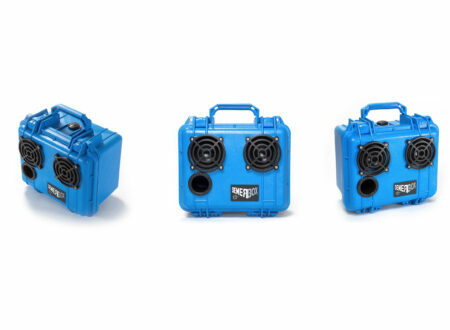 They are made in versions to suit those who just want to have fun, especially with the sea and surf, and for those who want to have fun off-road or on, even out in the sweeping dunes of the desert. 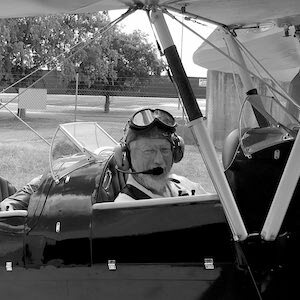 The things that Bruce Meyers loved to do – these are the things the current production Meyers kits are designed to deliver. And for the more serious competitive desert racer with necessarily deep pockets there is even the DualSport S.S. which moves away from the Volkswagen Type 1 with specially designed chassis, suspension, brakes, and a Subaru horizontally opposed flat six engine. Bruce Meyers has indeed met with both triumph, and disaster, and emerged from it all having learned some of the more difficult lessons of life. He has established a legacy, and earned a respected place in the history of automobile design and of course, of motor sport. Photo Credits: Bruce Meyers, Meyers Manx, RM Sotheby’s.